This one is highly recommended for all-purpose, household use. Two types of nozzles are excellent for handling different locations. Organic defense against bugs is excellent for households with children and/or pets. Stink bugs are a huge hassle. Smashing them like flies only adds to your issue when they release that awful smell. There are a few other ways you can get rid of stink bugs, but we’re going to go with the element of surprise, the spray. Let’s take a look at some of our recommendations. How Do I Choose A Spray? Ortho is a reliable brand in the best control world. This spray will take care of a few different household pests, including fleas, dust mites, and yes, stink bugs. Ortho’s spray is an all-purpose spray that helps treat bug issues and prevent further infestations. You can even treat fabrics you travel with to prevent bringing anything home with you. It’s an ultra-fast-acting formula with a targeted spray length and width. It’s safe to use on your furniture and won’t stain or ruin most household finishes. They handle bugs that are already resistant to other pesticides. The bottle comes in a regular and travel sized, so you’re protected wherever you go. The smell is a little bit lighter than some other types of sprays. It treats fabrics, hard surfaces, and small cracks where bugs may be getting into the house. Terro’s formula is specific for stink bugs. It doesn’t have much of an odor and is formulated to be non-staining for most surfaces. It features a two-way spray nozzle so you can treat spots or crevices. It’s also suitable for indoor and outdoor use. It works quickly so you can treat the outside of the house as well to prevent stink bugs from coming inside in the first place. It can get a little messy if you use the spray function. It’s a slightly oily consistency so be sure to test a small spot to make sure that it doesn’t leave a residue. It’s helpful both for treating the bug issue and preventing a new problem from arising. When you spray cracks and crevices, the oils create a barrier that kills bugs when they cross it, preventing them from multiplying inside your house. smell is less severe and may be a better alternative for allergy sufferers. If you’re nervous about spraying chemicals into your home and want a nontoxic alternative, Eco-Defense uses natural compounds to treat and eliminate many common household pests including silverfish quickly, stink bugs, and other common household pests. It’s very effective in treating bugs, but it doesn’t really prevent them from infesting your house. The natural compounds don’t have the same staying power as the true chemicals. However, the tradeoff is that it’s safe for children and pets. You’ll have to spray it more often for it to work as a preventative. It’s a USDA certified bio-based product at 96%. The company’s mission is to produce safe alternatives to chemical-based pesticides. The smell is much milder than other synthetic chemical based cleansers, and it shouldn’t irritate anyone in the household with allergies. This liquid spray comes in a gallon size with a handy sprayer. It’s odorless and doesn’t stain your surfaces (although you should always test an inconspicuous spot just to be on the safe side). It has a continuous spray option for when you’re treating an entire house. It kills stink bugs and other common household pests such as roaches, flies, and mosquitos. It produces a residual effect, so it continues to treat the house long after you’ve sprayed it. The sprayer sometimes clogs, so be aware that the weakest point is the equipment. If you’ve got a severe infestation, this one might be a better option than some of the spot sprays we have on the list. It’s meant to cover larger areas and continue working for more extended periods of time. Treating bugs indoors can be delicate because you don’t want the bugs to release the odor. Your solution depends a lot on the state of your infestation. Are you seeing just a few bugs at a time or are you swarming in them? What Kind Of Infestation Do You Have? Small infestations are typically handled with a hand-held spray of some kind. You just need to kill the one or two already in your house and maybe spray a crack where they seem to be. There’s no need to coat your home if there’s no evidence of an infestation. Large infestations will require more coverage. They’re often the sign of a break in the sealing of your house, so you’ll want enough to saturate the outbreak and coat where they seem to be coming in. Large infestations also mean you probably want a solution that continues to work even after the initial spray so that you don’t wake up re-infested. Are you seeing swarms of stink bugs all around the house or are you seeing bugs here and there? If you have a whole house infestation, it’s going to get really annoying to try to keep up with a simple spray bottle. Larger areas require something easy to apply. Gallon sized containers are excellent, as are continuous spray nozzles. You can quickly apply the product through a large area. Simple hand sprays are suitable for single bugs or small areas such as a windowsill. Aerosol cans with either a spray or targeted nozzle are good for getting both into crevices and spraying bugs themselves. Large infestations can be controlled by applying a pesticide barrier outside. This action reduces the likelihood that any bugs will make their way inside. If you’ve got an infestation within the walls or crevices where you can’t sweep them out, proceed carefully applying an insecticide because decaying bugs release a strong odor. Treating bugs indoors can be delicate because you don’t want the bugs to release the odor. Preventing them from coming indoors is ideal, but if you can’t, killing them without releasing the scent is also critical. We recommend using a natural spray indoors to target individual bugs and using a stronger pesticide outdoors to prevent infestations in the first place. You can handle most stinkbug infestations yourself because they don’t tend to get into hidden places the way other types of household pests do. Make sure you handle your stink bugs before things become an issue. The last thing you want is for one bug you ignore today to turn into a thousand later. 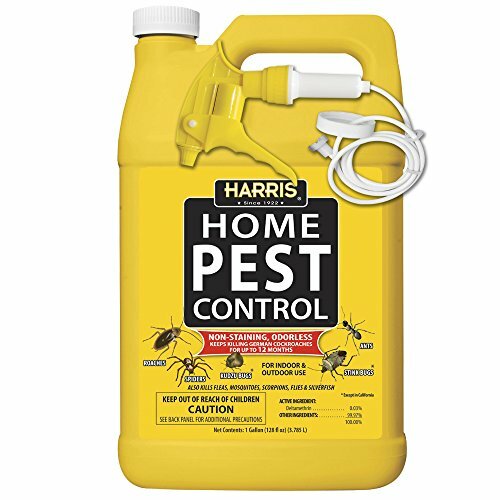 Most of the products on the list are excellent for handling a variety of infestations and should take care of everything.